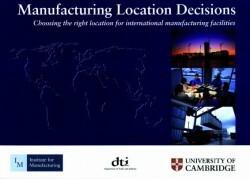 Making the right decisions about the location of manufacturing facilities is vital in order to compete in global markets. Those who make the best choices can gain a major source of competitive advantage. This workbook offers a systematic process to help managers with such decisions as: the selection of new sites, the relocation of existing ones, choosing which sites to upgrade and which to close down.